The leitmotif in this series is the French Mediterranean tourist resort of La Grande-Motte, a super artificial coastal town that Sarah Van Marcke visited and examined several times in recent years. It is one of those rare cities that were planned entirely from scratch and were designed around a well-defined concept by a single architect. In this case, the French architect Jean Balladur was the key figure. In the late 60’s, in a very short time, La Grande-Motte rose amid a Mediterranean saltwater marsh. The area had to be completely drained and got coated with a concrete skin, artificial plants and (today) out-dated futuristic ziggurats and pyramids had to swallow hundred of thousands of tourists during summer season. The half a million alien trees planted there are exactly the same age as the buildings. Each year, the mosquito population is skilfully suppressed during the peak season with crop duster planes. During off-season the town is empty, the contrast is hallucinatory and fascinating. During nearly ten months, everything is being locked, the streets are empty, the parking slots go up and the mosquitoes take over. 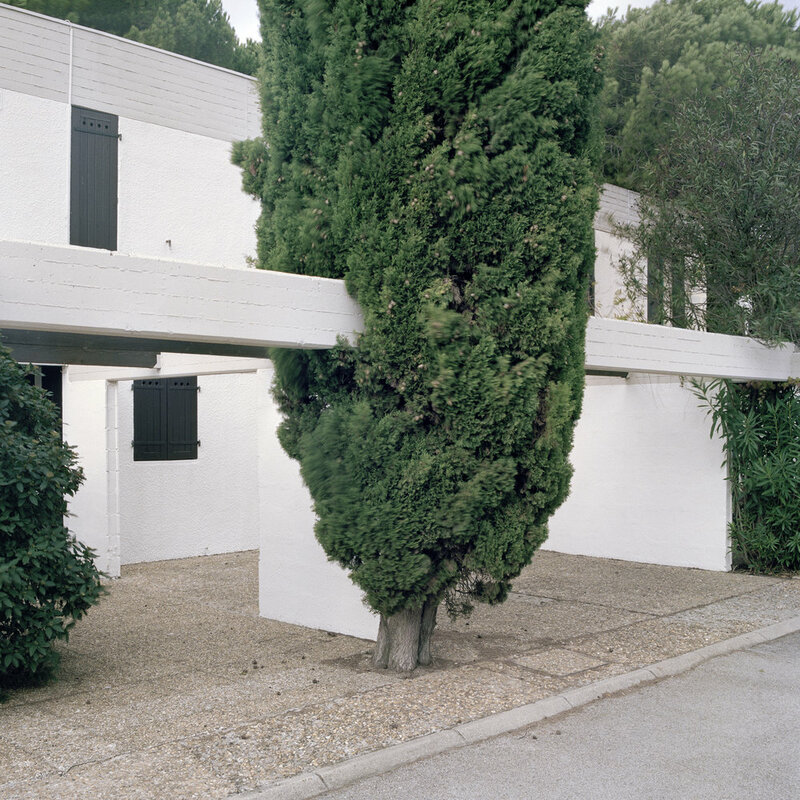 This series of photos and videos are observations, investigating the artificial urbanization of La Grande-Motte in various ways. Sarah muses over the design of a city whose sole reason for existence is tourism. In filmed and photographed actions, Sarah works with the seasonal occupation of the city or satirizes the artificial exoticism of La Grande-Motte. The oppressed role nature gets to play in this whole urban project is scrutinized. At the same time the works are odes to our collective memories of holidays at sea: the act of deflating an air mattress, stuffed cars or plastic bottles with lukewarm soda. Sometimes interventions haven’t been necessary when a tree embraces the architecture or when architecture pierces a tree. And maybe the artist found a chair that was half buried by the wind and the sand by chance.